Jambu wuluh or belimbing wuluh or Starfruit (avverhoa bilimbi). Plants of this type belimbingan starfruit, the fruit has a distinctive, elliptical and sour, but behind its uniqueness, starfruit has a variety of properties that are beneficial to health such as high blood pressure, acne, cough, diabetes, rheumatism, mumps, thrush, sore teeth, bleeding gums, until as an antibacterial. Starfruit suitable to be planted in a pretty sun in open spaces which have a height of less than 500 meters above sea level. This plant is commonly grown in the garden or sometimes grows wild in fields or forest edge. In Indonesia processed fruit starfruit more widely used as a syrup, candied, or spices. It is also useful for cleaning stains on fabrics, polished goods made ​​of brass and as a traditional medicine. 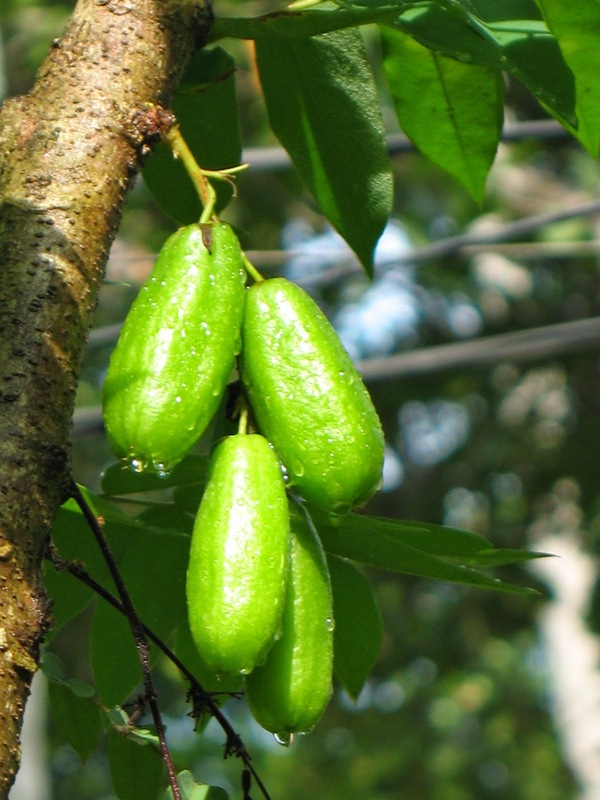 While the use of starfruit to overcome various diseases has not been done because the benefits are not widely known to the public. Besides Indonesia, the species is now cultivated and found throughout the Philippines, Sri Lanka, Bangladesh, Myanmar (Burma), Malaysia and India. Part used is fruit, stems, leaves, and flowers. The fourth section contains many compounds berkasiat. Among them are saponins, tannins, glucosides, to calcium. Almost all parts of the plant well starfruit leaves, fruits until the stems have health benefits. Chemical constituents in general on the type of leatherback belimbingan are tannins, saponins, glucosides, sulfur, formic acid, peroxide. Various studies have further mentioned that the fruit starfruit contains flavonoids, triterpenoids. While the leaves contain tannins, flavonoids, and terpenoids. Starfruit leaves are commonly used to reduce pain or tenderness, as well as a germ killer and can lower blood sugar levels. While the interest efficacious as cough medicine and water fruit juice balk to the intake of vitamin C. Freshly squeezed fruit can also be used to wash it as dandruff remover, or rub the skin for pain medications such as tinea versicolor. Sour taste and cool the fruit can be used to relieve pain, increase the expenditure of bile, anti-inflammatory and even as a laxative urine. Traditionally starfruit, has been used for generations (empirical) by the public as food additives to give a sour taste natural. Where the fruit is the most numerous and easy to use. The presence of tannins in starfruit, according to physician this herb, can potentially help process shed fat, with a particular dose in accordance with the requirements tubuh.Namun also feared excessive use resulting in undesirable effects such as diarrhea. 3 pieces of starfruit washed with clean water and then cutted, then boiled in three cups of water until the remaining one gelas.Setelah cold, filtered water and drink after breakfast. Or fruit starfruit shredded, squeeze to take water and taken once a day. It is important to note, for patients with hypertension that urine contains oxalate crystals are advised not to use this recipe because the ingredients they contain oxalic acid. Hypertensive patients with disorders such as ulcers of the stomach is also not advisable to use this recipe because it tastes sour instead lambung.Sebagai feared increases sour starfruit can be replaced with sweet star fruit. Fruit starfruit can also be used to reduce the problem of acne. How, to prepare three fresh starfruit, wash thoroughly. Then the shredded pieces and given a little garam.Tempelkan on acne prone skin, twice daily. Or fruit starfruit shredded, squeeze, with salt and rub it into the area with acne. Saponin compounds in stem Leatherback Wuluh alleged potential as an antimicrobial. A study conducted by Faradisa in 2008 mentions that the saponin extract can inhibit the growth of Staphylococcus aureus.